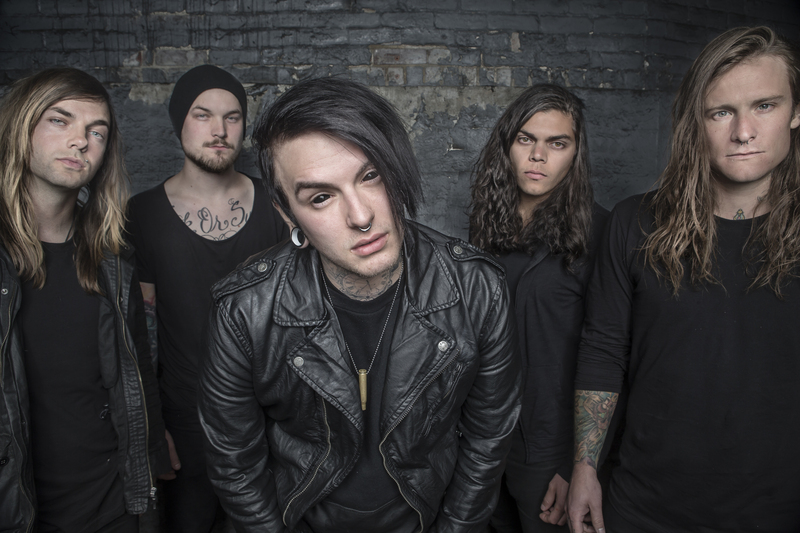 Utah-based rock band, Get Scared, is gearing up to release their new album Demons. The quintet consists of members, Nicholas Matthews (vocals), Johnny “Johnny B” Braddock (guitar), Adam Virostko (guitar), Bradley “Lloyd” Iverson (bass), and Dan Juarez (drums). Get Scared formed back in 2008 and their first EP, Cheap Tricks and Theatrics, immediately followed. Since then, the band has toured with acts including Escape The Fate and Black Veil Brides. Get Scared is currently on tour with New Years Day promoting the new record set to be released on October 30th. In the meantime, learn more about the band and Demons from their responses below and check out our review from the Cleveland tour date here. Dark and Heavy with melody, high energy with honest lyrical content. We all grew up together as friends playing in different bands until he finally narrowed down what members that fit get scared. What made you pick the band’s name, Get Scared? Getting scared is big part of making sacrifices for following your dreams and that is exactly what we had to do to create our band and make it what it is. We are all influenced by different music which is kind of the key aspect in our band’s sound. From Michael Jackson to KORN. We are influenced by things we relate to, lyrical content, melody lines that we find catchy, and music that moves us. From day one we’ve always written our music a little different than most bands are used to but it works for us., we all are pro tools/ableton savvy. We immediately record an idea we have, email it back n forth until we’re satisfied with a full song, then get together and play it out live. Not a single get scared song has been rehearsed fully as a band without it first being analyzed multiple times in the recording process. We practice about two weeks out of the month for about four to five hours a session, technically it should only take about two hours to go through all our songs but we spend a lot of time hanging out. From start to finish, how long did it take to create Demons? Collectively it took about five months of writing. Can you talk about the inspiration behind some of the tracks on Demons? Mainly the whole album is about overcoming the personal demons within you, such as dealing with addictions, judgment from others and the loss of loved ones. Do you play covers at shows? If so, which ones are your favorites? We did a Lit cover (my own worst enemy) that we played warped tour 2014. That song is very fun to play but other than that we actually rarely play covers, there are songs we’d love to learn, just haven’t had the time. We try to get interviews and all other responsibilities done before we go on stage, other than that we just hang out, explore whatever new city that we’re in whenever we have the time.. There is a lot of hurry and wait in this industry. Do you have favorite venues/cities? If so, what are they? Utah will always be our favorite just because we are very proud of our hometown, New York City, Denver, Richmond, Milwaukee, Indianapolis, Mexico City, Montreal, all come to mind first. That we are normal people with all the same demons as the next person. All we can hope is to show someone that they aren’t alone in their daily battles whatever they may be. In 2011 Nick left the band, we were left with the decision to quit all together or with patience and perseverance, rebuild. We decided to rebuild and it has been the best although hardest, decision we’ve ever been faced with. Luckily we haven’t had too many crazy fans, all the fans that we’ve met have all been so sweet, down to earth and supportive. Anything funny your fans should know? Nick has an unfinished Disney tattoo on his lower back that Johnny B gave him when he first was learning to tattoo.. It looks horrible. What can we expect from Get Scared in the coming months? A bunch of music videos which the band plans to create ourselves. In the works for overseas touring, we’ve gotten a lot of requests so we are working very hard to make that a reality. We are also in the works of creating a special club for our special fans, you all will hear more about that very soon. This entry was posted in Interviews and tagged agora, artist interview, band interview, band tour, cleveland agora, Demons, Demons album, Get Scared, Get Scared band, Get Scared band interview, Get Scared demons, Get Scared interview, Get Scared music, New Years Day, October 30th, rock, rock band, tour. Bookmark the permalink. ← Review: The Wonder Years with Motion City Soundtrack, State Champs & You Blew It!